The recent budget decision to raise the threshold for stamp duty to £120,000 might be good news for some would-be first-time buyers. 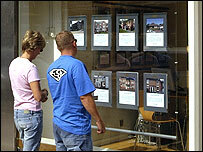 But many still face a struggle to get their first foot on the housing ladder. In Real Story, property expert Barbara Goldsmith comes to the rescue of three first time buyers. Despite the recent buoyant market, Barbara believes now is a great time to buy a house and shows the programme's first time buyers where best to buy and how best to raise the money. Peter Fletcher, a first-time buyer from Manchester, feels locked out of the property market. At 26 and with no prospects of being able to afford the property he wants, he ventures to Spain to pick up a bargain. Peter finds out about the prospects there for buying abroad and meets one first-time buyer who is one step ahead. Real Story also meets Richard Arundel, an estate agent from Gerrards Cross in Buckinghamshire, who cannot afford a decent house for his budget. In this highly sought-after area, Richard realises even with his parents as guarantors Gerrards Cross is no place for first time buyers. But Barbara is able to come up with solutions that increase his options. And finally, the programme talks to Gary Birchall and Nadine Hepworth from Ilkley in West Yorkshire who have given up hope of ever moving out of the parental home. The couple are desperate to find their own home for £90,000. Barbara finds them a property they can afford in an area she claims will rocket in price. The programme asks if government plans to build £60,000 homes will help first-time buyers and examines how far the reduction in stamp duty will really assist them to get a house.